False Unicorn Root was used by Native Americans and early settlers for virtually all complaints, including liver and kidney ailments, worms, fevers, and indigestion, but perhaps its greatest value came in relieving female disorders of the reproductive organs, including menstrual and menopausal symptoms. It is believed to help genitourinary complaints and infertility in both men and women! False Unicorn has been compared to Korean (Panax) Ginseng in its overall effectiveness as an herbal remedy for numerous ailments. It has bitter properties that act as a tonic on the liver and digestive tract. False Unicorn Root is most often used in the aid and normalization of the female reproductive system. Hormonal imbalance, miscarriage, painful menstruation, pelvic inflammation, and ovarian cysts have been treated successfully using this herbal tincture. The herb may also help to treat conditions such as endometriosis, vaginal discharge, prolapsed uterus, pelvic inflammatory disease and threatened miscarriage (this last application is no longer recommended without consulting a physician. False Unicorn and Red Clover are herbal supplements for women that can act like weak estrogens in the body. Naturopathic doctors believe that these herbs help balance hormone levels, either making up for a shortfall of estrogen or encouraging your body to excrete excess amounts. False Unicorn Root supplies rare trace minerals including sulfur, copper, cadmium, and cobalt. False Unicorn Root appears to have great value treating female disorders and has been used for centuries to ease a multitude of women's complaints. The herb may be helpful in cases of early menopause after hysterectomy or to restart the system after years of contraception. It is also said to relieve vaginal dryness, hot flashes, night sweats, mood swings, depression and other symptoms related to menopause. Further supporting women's health, False Unicorn Root is said to relieve many "female problems," including menstrual difficulties. As a potent antiseptic, it helps to relieve urinary infection and irritability, with a nourishing effect that is helpful for genitourinary weakness. As a diuretic its properties also promote urine flow, ridding the body of excess fluid and promoting the overall health of the urinary tract. It has a longtime use for kidney and liver disease, especially in diseases due to a poor action of the liver and not to a weakness of the heart or circulation. It is also thought to be a good remedy for albuminuria. False Unicorn Root has been useful in the treatment of loss of appetite or nausea or vomiting in pregnancy and is believed to be helpful for expelling worms (including tapeworms) and other parasites from the intestinal tract. 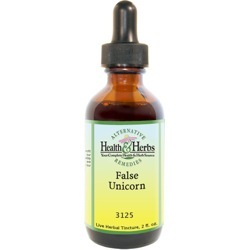 False Unicorn extracts have also been shown to deliver results when used for venereal diseases, especially gonorrhea. Men who suffer from an enlarged prostate and/or impotence may find relief by using False Unicorn Root tincture, as it may reduce the swelling of the prostate gland. This herbal supplement repairs the prostate gland and nourishes it as it is rich in minerals molybdenum and zinc, two important male sexual health minerals. False Unicorn Root has many medicinal uses, as in the treatment bad breath associated with a common sore throat, cold or flu. Ingredients: False Unicorn Root, Structured Water, 20% Alcohol. Non-Alcohol: False Unicorn Root, Structured Water, and Vegetable Glycerin. Instructions: Use 6-30 drops in mouth, juice or water. May be taken 3 times daily. Shake well. Store in cool dark place. Keep out of reach of children. Contraindications: Although this herb has been used to diminish miscarriage, pregnant women should not use False Unicorn Root without first consulting a physician. Overuse (many times the recommended dosage) causes vomiting, and it is wise to consult with a healthcare provider before using this herb for specific applications.